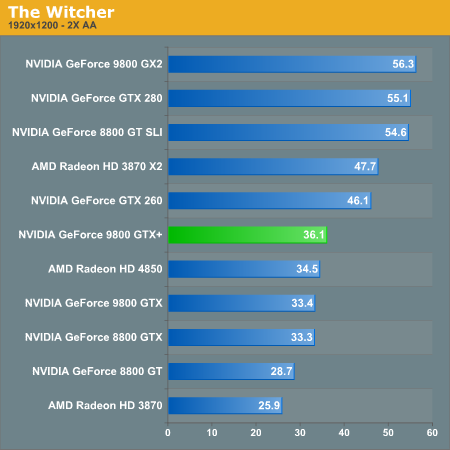 in the UK it is possible to get an hd 4870 for less than an overclocked 9800gtx that runs the same values as the gtx+, and the 9800gtx+ is more the £100 more than the hd 4850 that is the one it competes with! does anyone else think nvidia have dropped the ball with this one? You didn't tell me the most basic things like what settings the games are at. Crysis runs at 31.3 with 9800GTX+ I see at 1600X1200, but wait, what settings? What DX version? This is pitiful guys. Just pitiful. The most basic of information lacking. And another thing, stop benching at 1600X1200 and use 1680X1050, like everybody on earth's widescreen LCD is. Using basic common LCD res's seems like another no-brainer to me. And what's with giving me a graph of one uber high res at one setting for each game, instead of several? My complaints apply to all Anandtech recent reviews, basically that aren't handled by Anand himself. If you read them you might notice such things as omitting tested game settings are the norm. Although, I was wrong about the 1680X1050 thing. I noticed that the other multi-line graph does have 1680X1050. Although 16X12 shouldnt be the main bar graph spotlighted on the page imo by the same token. I just prefer each game tested at maybe 3 resolutions and those printed as bar graphs rather than the way AT has gone to the line graphs. I know they claim the latter provide more information, but I just think they aren't easy to read enough. And there's really no use for them, they're already printing one bar graph and the second line graph, so what, they're saving one graph per page? big deal. 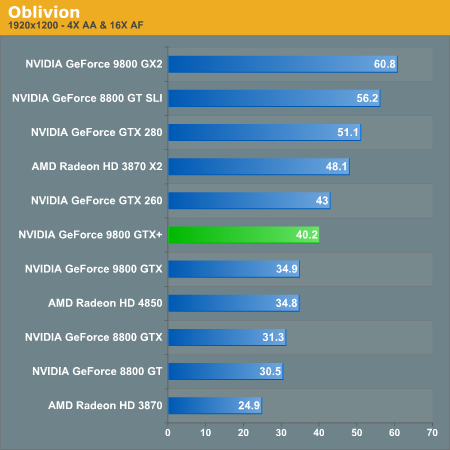 The amazing thing I noticed is that the 8800 GT SLI is #2 to the 9800 GX2 in most games and falling to #3 a couple of times when the GTX 280 happens to break into the top 2 positions. It looks like if you own the GTX 280 you need to play Enemy Territory where it's #1 except at 1680x1050 and also a couple of other games where it is in the #1 position at 2560x1600. The question that I would like answered is will any of these new cards scale the way the single 8800 GT does going to 8800 GT SLI? 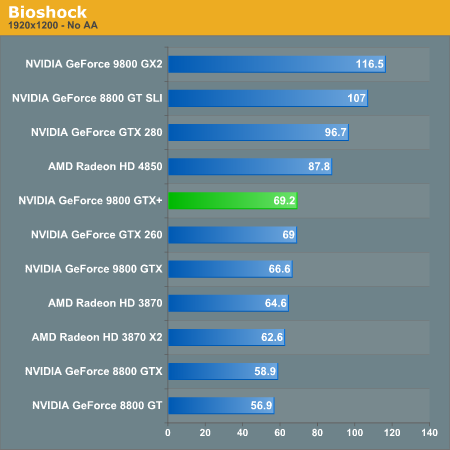 The more I look at these and other benchmarks the more I'm inclined to stay with my 8800 GT SLI. Maybe it's time to jump ship to the 4870 CF! Last week I wanted to settle for a 9600GT.